Get with Ellis and get your commercial HVAC system installation started. 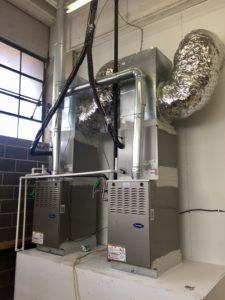 No matter your commercial HVAC installation needs, Ellis can handle it. We are committed to providing comprehensive services at competitive prices, in a timely manner. We will pair you with a contractor who will discuss install options with you. With 40 years of experience serving commercial enterprises in the North Texas area, we know our industry, its technological advancements and the impractical nature of ever-changing Texas weather patterns, which all affect your commercial HVAC system’s efficiency. We’re ready to tackle your new project to get you going strong. Split-system heat pumps and air conditioners – Commercial split-system HVAC systems provide better air quality and comfortable indoor settings, literally splitting the transfer of heat between units outside and indoors. The switch is based upon the season. Variable refrigerant volume (VRV) and variable refrigerant flow (VRF) systems – Air conditioning systems go back to the early 1900s but new technology like the VRV and VRF systems allow for a customized heating and cooling experience in your commercial property. This newer technology is an excellent way to help maintain lower utility bills. Ductless heat pumps and air conditioners – This HVAC systemt works similarly to the split-system, however, they have the added benefit of not requiring tubes and ductwork in order to pump air into your building. Rooftop packaged systems – Rooftop packaged systems are modular modular, allowing you to add or remove units as needed for your business, complex, office park, etc. We can design a system which benefits your business’s heating and cooling needs. Indoor air filtration systems – Indoor air quality is a large part of the experience people have with a commercial property. Ellis installs air filtration systems, which assist with the removal of pollutants, like smoke, kitchen exhaust, mold, pollen, and other unwanted allergens from the air. Ventilation systems – Your restaurant or catering service needs the right ventilation system to meet National Fire Protection Association (NFPA) regulations. Your business thrives when your customers and employees can shop and work in comfort. Having a reliable central air conditioning system is critical to that experience. Purchasing a new system or repairing an existing one shouldn’t take more time than necessary and shouldn’t cost more than what it takes to do the job right the first time. Whether you are a new business under construction or if you are moving into an office, storefront, or free-standing building for the first time we have numerous HVAC expert technicians who have the skills to install the most modern and efficient indoor comfort products on the market today. Maybe you are in need of commercial-grade HVAC systems. If you’re expanding into a larger space, or starting a new build – no matter the situation Ellis Air Conditioning and Heating is prepared to help. We know you have to heat and cool your booming business, apartment or condo complex, church or office park, and our experienced, NATE-certified technicians have the know-how to install the systems you need. We’re an authorized Carrier dealer and our team is expertly trained to install their products, and many others. A properly installed and maintained system will take care of your heating, cooling and air quality needs for years to come. Call our experts today at (972) 291-9316 to get a free estimate and to get started on your brand new install or your retrofit/ replacement. To find out more about our service area, click here and if you need commercial repairs or services, find out more here.